"Powerline to nowhere: $100M powerline costing taxpayers millions" was a provocative title for a CTV news story last week. The network reported their investigation indicated a transmission line without transmission wires wasn't transmissioning electricity, which didn't surprise me - what did surprise me is the video segment on the report implied "it had never been needed at all." The reality is far different than CTV's viewers would understand: the inability to "Install two new 230 kV circuits between Allanburg TS and Middleport TS" to "Increase import capability on Queenston Flow West," has cost many, many times more than the $50 million reported by CTV. The need for that was apparent to all who read the Buffalo New in 2011, as it reported on the international agreement regulating the water usage from the Niagara river. Prior to the completion of the tunnel OPG was unable to utilize their full allotment of water for power generation and an agreement allowed the U.S. side to generate power with the unused quota. 5% of the water drawn on the river equates to 10% of the Canadian allotment. In 2011, assuming OPG lost half the prospective income on 10% of the potential hydro output the cost was about $22 million a year. 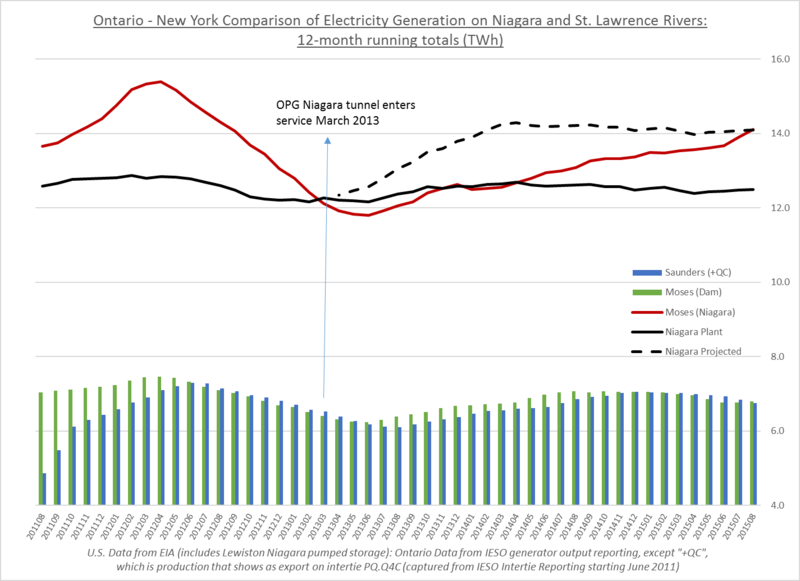 When the tunnel project completed in March 2013, a strange thing didn't happen - the annual output from OPG's Niagara river units remained essentially flat. The production from hydro-electric facilities is dependent on water availability, and in general the water levels on the great lakes sharply increased since 2013. That could explain the increase on the U.S. side, but its a painful coincidence that since the $1.5 billion Niagara tunnel was completed, unaccompanied by the completion of a Niagara-reinforcement transmission line, U.S. production has increased by about the 1.6 TWh Ontario's production was predicted to increase - while OPG's production is flat. Note the same relationship exists between the Moses Dam and Saunders Generation station at the other end of Lake Ontario - and there, once I adjusts for output discretely steered to Quebec's grid, the two side do generate the same levels of electricity. $67.2 million is what 1.6 TWh collects at OPG's currently regulated rate for that output. It's been 2 1/2 years - which would be ~$168 million, or half that if the U.S. side could use the water and paid back Ontario with half the generation. More likely it would be over half because while OPG may be entitled to half the output, it has no way to transmit that half regardless. Call it $100 million and growing by $50 million each year. This is 10 times the interest on the transmission line CTV reported on, which is conservative as OPG's spend was 15 times greater on its project. There are other costs being rung up besides that incomplete transmission line and a tunnel project which hasn't noticeably increased generation, most notably the largest industrial wind turbines in the province will bestride the wireless towers - with new transmission being built to get that bottle-necked power out of the region. The new route is required because of the inability to complete the Niagara-Reinforcement line, which CTV reports Energy Minister Bob Chiarelli explaining as, "a dispute between two First Nations that needs to be resolved by the federal government.? The Six Nations have these interests because developers get paid more for the output if the project is deemed to have aboriginal participation of at least 10%, the project received a higher rate in the feed-in tariff contract offers. Assuming each of these projects has a 10% aboriginal interest (the minimum for the adder to apply), the added cost to Ontario ratepayers of Six Nations involvement totals over $6.7 million a year. The little Calendonia dispute "between two First Nations" has had a huge impact on Ontario's electricity ratepayers. 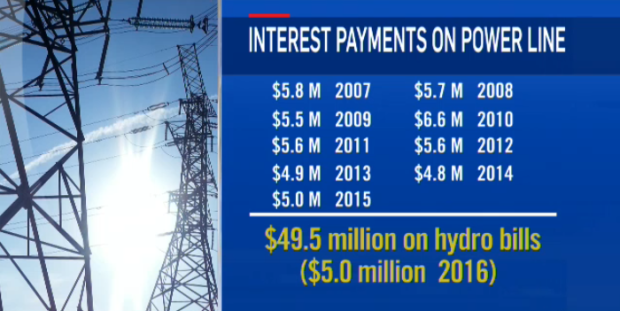 CTV reports on $5 million in interest charges but I've demonstrated the costs on the public generation side are likely 10 times that, and then there's the additional $6.7 million Ontarians are obligated to pay for renewable power projects where those who prevented the Niagara reinforcement line reside. If OPG's Niagara plant goes another decade without demonstrating the 1.6 TWh annual increase promised by the tunnelers, the political nonsense in this region will be as expensive as the gas plant scandals in the Toronto area. As impolitic as it is to say so, perhaps there's something not quite right about race-based electricity procurement policies. 1. Quoted from The Ontario Reliability Outlook of the Independent Electricity System Operator (IESO), March 2007. 2. I included quotes from a 2005 Hydro One document in a blog post on this topic in 2014. The Hydro One document has since been removed.